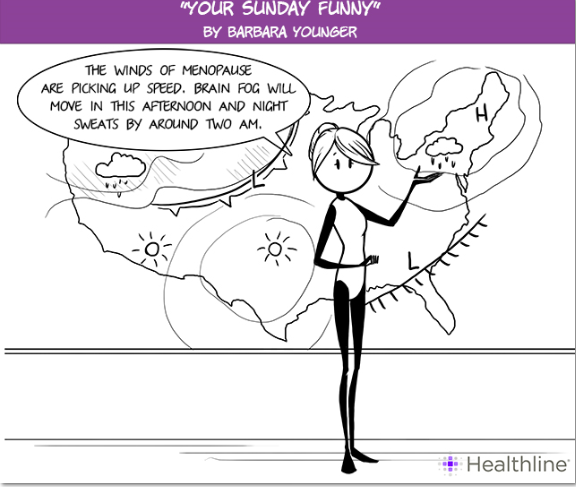 I had the best time writing menopause cartoons for Healthline. Here are three more! Remember when you first learned about periods? That innocent little dot at the end of the sentence became the name for something a whole lot more intrusive in your life. The cartoon above is the wackiest one I wrote. 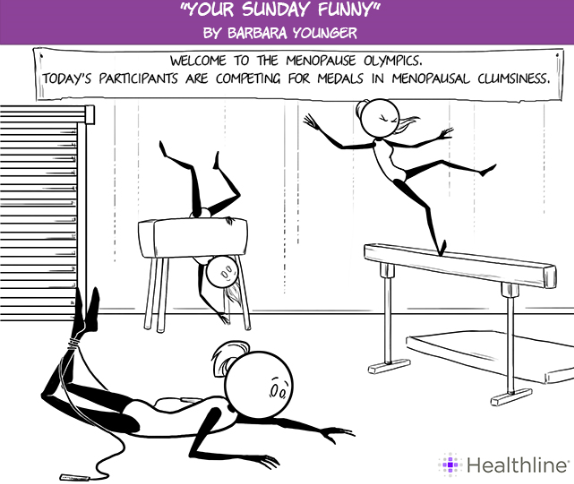 Illustrator Julia Selutina did a wonderful job drawing that crazy skip rope. Below, is a reference to brain fog. I had moodiness and sadness but don’t remember any really foggy days. What about you? But I definitely had klutziness. Here’s a short post I wrote about it in 2012. 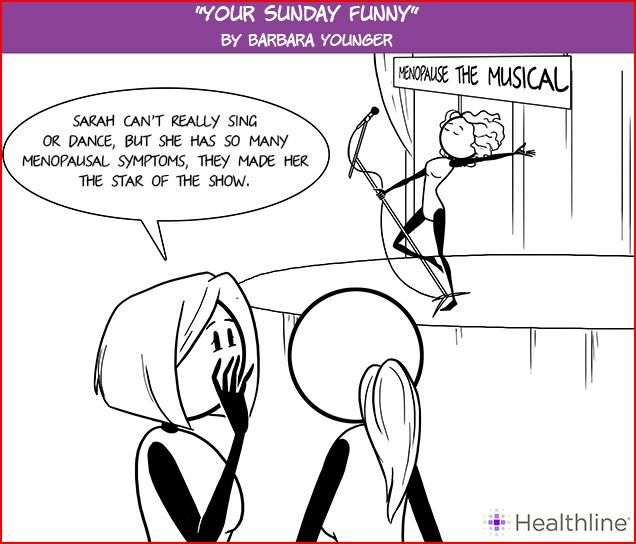 The health websites report that fluctuating hormones can affect body coordination. Yoga, an exercise I keep avoiding even though my friends swear by it, is said to work wonders for coordination. So thanks for reading three more of my cartoons. 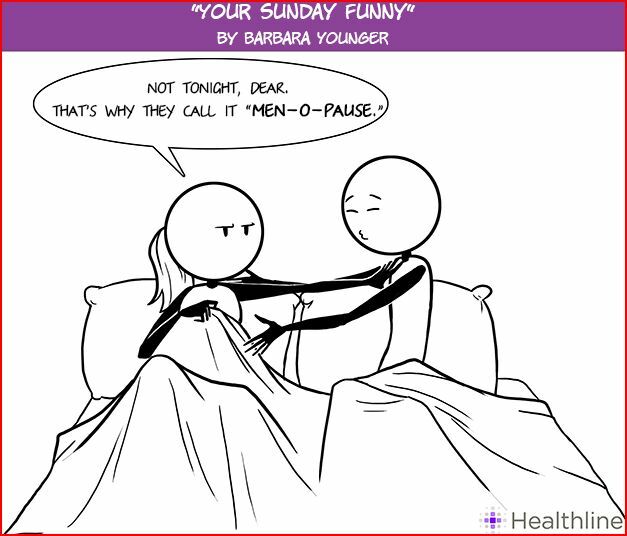 Gotta laugh, some, at menopause. Gotta laugh, some, at everything! Congrats to Greta, who won The Life-changing Magic of Tidying up. Congrats to Silvia, who won Rhythms. Congrats to Vickie, who won the Crila. And congrats to Judy, who won DIYA: A Megawatt Approach to Change. 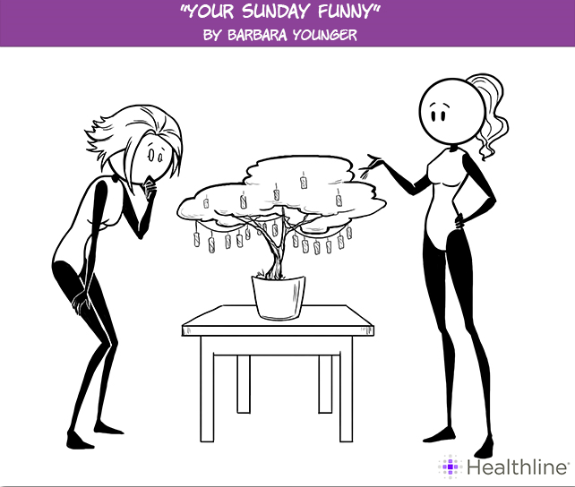 A few months ago, Healthline invited me to come up with concepts for menopause cartoons. Whoopee! I wrote twelve, and illustrator Julia Selutina brought them to life. Above is my favorite. 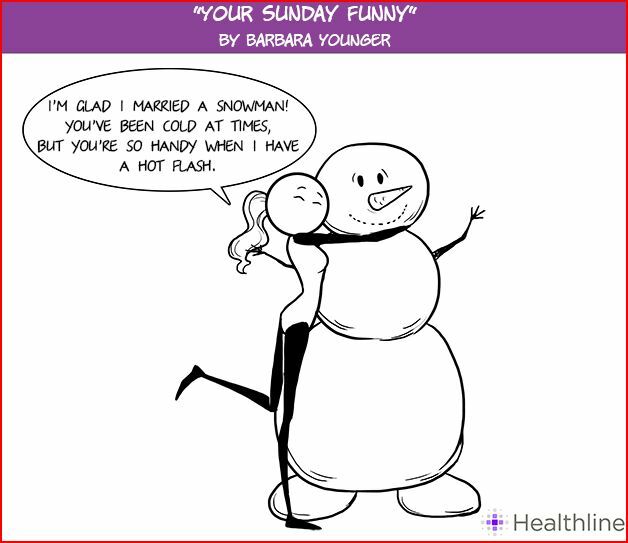 I’ve no clue how this idea came to me, but the thought of a menopausal woman marrying a snowman seemed way cool (pun intended). Not sure the pun on “men-o-pause” (below) is original, but it certainly speaks to the lowered libido that The Great Pause can bring on. Here’s a Healthline article about discussing lowered libido with your partner. Many women feel shy or uncomfortable bringing up the topic, leaving their partner guessing and sometimes coming to the wrong conclusion. And although I loved doing community theater this winter, I’m not sure I’m ready for Menopause the Musical. I did enjoy attending the show with Cliff, who was a very good sport. Catch the production if it comes to your town! So there you go! My first three cartoons. More to come! 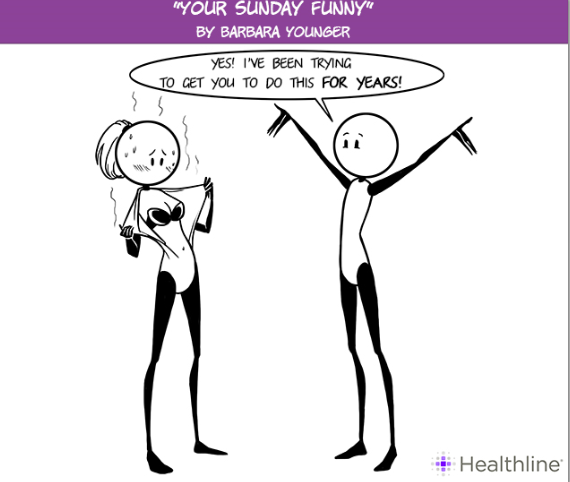 Check out Healthine’s excellent section devoted to menopause. 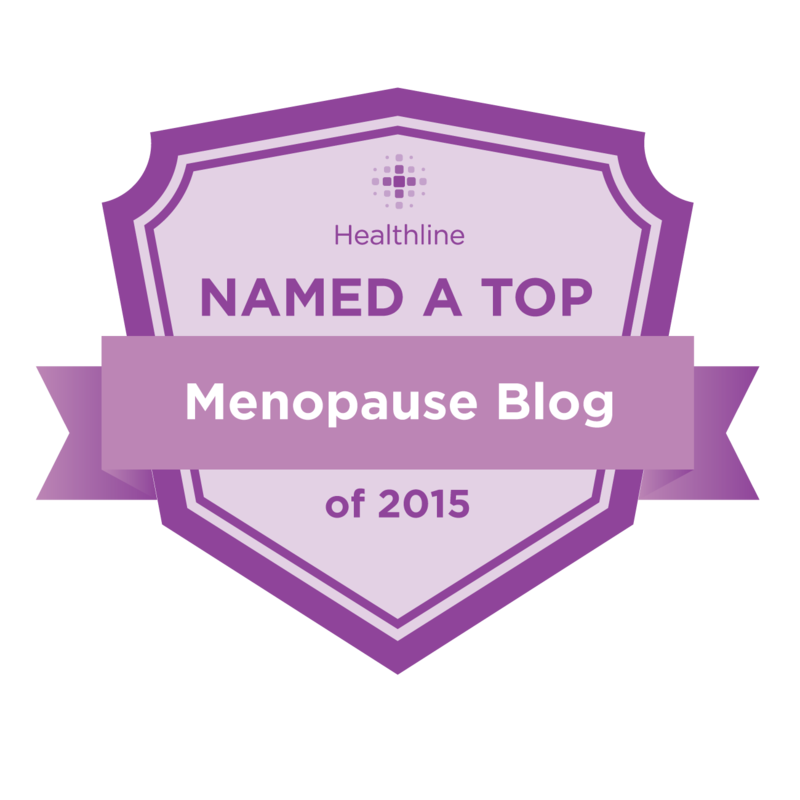 I am delighted that Healthline named Friend for the Ride a Top Menopause Blog of 2015. 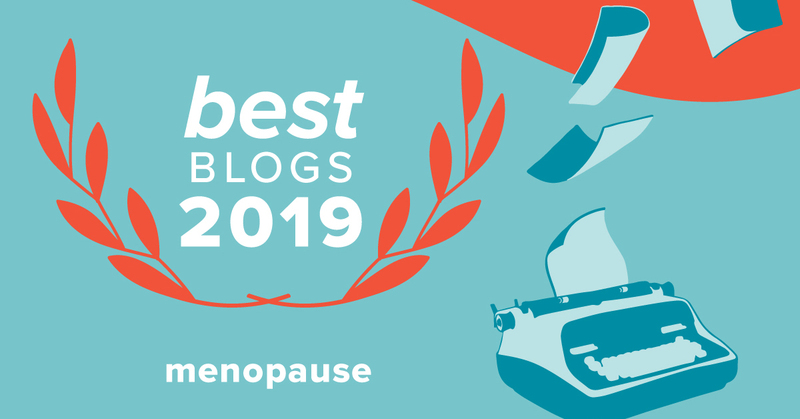 Meet my sisters in menopause crime by clicking here. 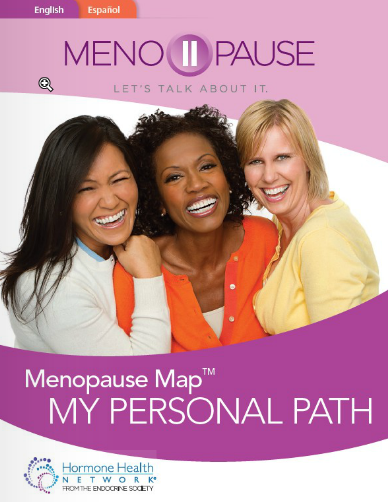 They say menopause brings on new adventures. What fun to write cartoons! 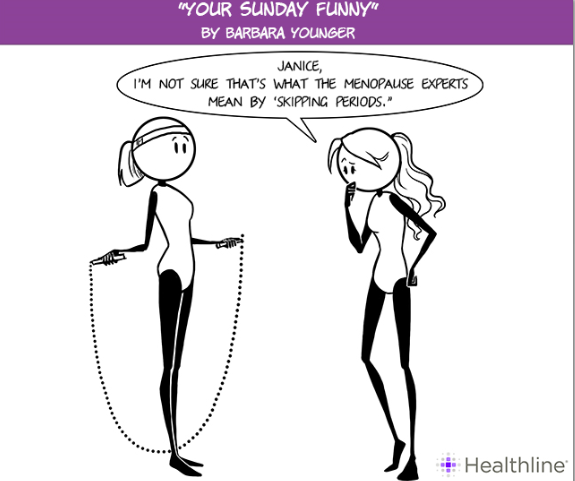 Thanks for taking a look and thank you, Healthline.